Unfortunately, what’s actually made it to the Stratford stage is a dull non-drama that smells of a commissioning process gone completely awry. Brontë: The World Without does indeed show us a world without – without conflict, without characterization, without substance or style. Without a clear reason for existing on stage, beyond the brand appeal of the Brontës. The one thing everyone who walks into Brontë: The World Without should know is that Charlotte, Emily and Anne Brontë were writers. It seems perverse to try to make the entire first half of a play ride on suspense over whether or not they will even try. There are several episodes of them physically writing (not the most compelling of stage actions) and we witness them deciding to publish their work and — in the production’s most well-realized moments, captured in Kimberly Purtell’s lighting — placing their books on a shelf with love and pride. But what are they writing about, why are they writing it, and how does this connect to their limited life possibilities? It highlighted the gothic elements of the works of Emily and Charlotte Brontë, before moving forward through the centuries to examine how the gothic tradition has influenced literature, fashion and culture right up to the present day. The Brontë Mastermind Challenge was billed as a fun-filled evening of fact and fiction with participants competing to be named the ultimate Brontë obsessive. Lucy Mangan checked whether the quizzers knew their Haretons from their Huntingdons, their Weightmans from their Smith Williams. Lucy Mangan is a columnist for Stylist magazine, a features writer and the author of five books. She recently co-presented a BBC documentary about the Brontë sisters. If you'eve ever wondered why many of the signs around Haworth feature Japanese characters, and why Emily Brontë’s Wuthering Heights is so popular in Japan, then July 1 is a good time to visit the museum! Thank you to the Williamsburg Players for their outstanding production of “Jane Eyre, the Musical.” A large cast of wonderful voices. All ages had big parts and each player carried their role wonderfully. Congratulations to the director, cast and company that produced a splendid show — and thank you! It was enjoyable from beginning to final notes. Thank you, orchestra, you were invisible but perfect. Well, technically it is the BOZAR Centre for Fine Arts which stands more or less in the Pensionnat Heger's place. Hand, Ashton, and Meadows follow up My Lady Jane (about Lady Jane Gray) with another tongue-in-cheek novel about a famous Jane—this time, Jane Eyre. In this take on the classic, Jane and Charlotte Brontë are good friends from school, and as Jane’s story unfolds, Charlotte records every moment of it—at first writing it as a murder mystery, then a romance. Jane can also see ghosts, and the Society for the Relocation of Wayward Spirits determines that she is a rare Beacon (someone who can control ghosts), offering her a high-paying job. The chapters switch among the handsome young Alexander, a member of the Society; Charlotte, who convinces Alexander to give her a temp job (and who falls for Alexander); and Jane, who spurns her job offer, heads off to Thornfield, and falls for Rochester. The authors’ prose holds all the flavor of a juicy period novel yet with the addition of numerous, witty asides. The narrative is full of wry humor—at one point, Jane thinks to herself about Rochester, “He was everything she’d ever dreamed about. Tall. Dark. Brooding”—and laugh-out-loud commentary. The authors’ affection for their source material is abundantly clear in this clever, romantic farce. The second prize goes to locally born and bred Bob Pegg. Researching for another project, he discovered that Charlotte Bronte and Karl Marx were both in Manchester on the same day in 1846. His play – The Salutation - imagines a meeting between these two great minds, using historical facts as well as dramatic licence to explore how their conversation may have gone. Wartością tego spektaklu jest muzyka wykorzystująca wiersz brytyjskiej pisarki romantycznej Emily Brontë „Come, Walk With Me”/"Chodź, chodź ze mną” – skomponowana przez Piotra Ślęczka (kompozytora, absolwenta Akademii Muzycznej w Katowicach). 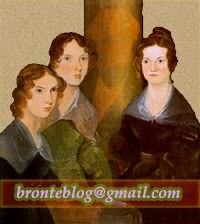 Libreriamo (Italy) lists books to reread including Wuthering Heights; Evie's Blog reviews Jane Eyre.